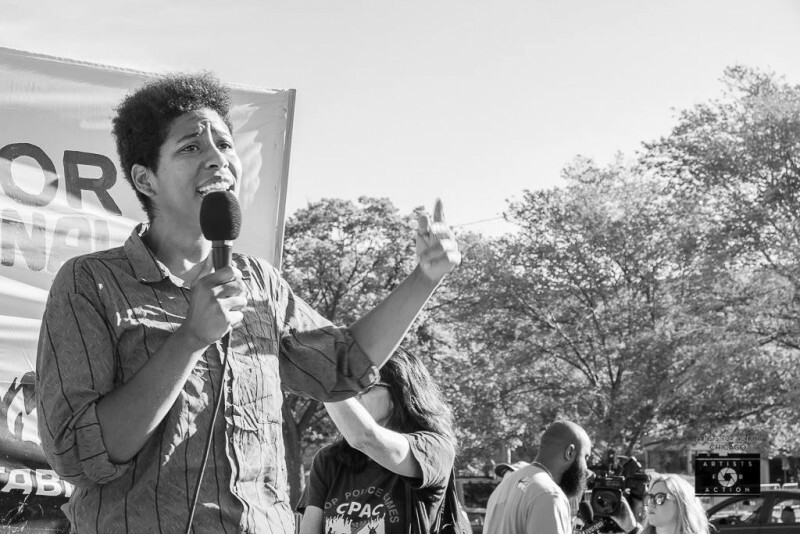 The movement against police crimes rallies for Laquan | Fight Back! Maria Hernandez of Black Lives Matter - Chicago speaking at the rally. Chicago, IL - 300 people came out to rally for justice for Laquan McDonald, Sept. 5, at the courthouse at 26th and California to mark the opening of the first-degree murder trial of police officer Jason Van Dyke. Speakers at the rally included Alderman Carlos Rosa; Rev. Otis Moss III of Trinity United Church of Christ; Esther Hernandez of Innocent Demand Justice and mother of Juan and Rosendo, wrongfully imprisoned by disgraced Detective Reynoldo Guevara; and Armanda Shackleford, mother of torture victim Gerald Reed. The mother of Antonio Porter, another torture victim, held her cell phone to the microphone so Porter could address the crowd from inside Stateville prison. Maria Hernandez of Black Lives Matter; Muhammad Sankari of the Arab American Action Network; and Frank Chapman of the Chicago Alliance Against Racist and Political Repression spoke. Jazmine Salas of the Alliance emceed the opening rally. The uncle of Steven Rosenthal, killed two weeks ago in North Lawndale, also spoke. Many speakers celebrated the Mayor Rahm Emanuel’s previous day’s announcement that he is not running for reelection. Everyone agreed that the movement against police crimes, and especially the protests after the release of the video of the murder of Laquan McDonald were the main reason for Rahm’s decision. Joe Iosbaker of Freedom Road Socialist Organization asked, “Who defeated Rahm?” Shouts of “The people!” and “We did!” came roaring back. There were solidarity rallies in New York City, Salt Lake City, Minneapolis and Jacksonville, Florida, as well as campuses in Arlington, Texas; Tallahassee and Tampa, Florida; a banner drop in San Francisco and a statement sent from the Dallas NAACP. Several of the organizations will return to the court on Thursday morning, Sept. 6. Van Dyke has a hearing then where the judge is considering revoking his bail because he violated the court’s gag order not to speak about the case, giving interviews to two TV and media outlets. Then the movement will come out again when the court reconvenes on Monday, Sept. 10 at 9 a.m.